I HAVE A NEW HAIR STYLE!! I am never usually in love with a hairstyle at first, but I totally am this time! It's basically a Vulcan mullet with shaved sides. LOL! My hair was cut and coloured by the amazing Ann-Marie Gucci at Le Salon Sugar in Blaineville, Quebec. She is always fun to chat with and very talented! We were both super excited about this cut. I was lucky to find her through my friend and talented YouTuber Izzy/HayzStrawberry. I ran out of Special Effects Virgin Rose (magenta) so I settled all Deep Purple with a little Fish Bowl in the fringe. I recently received two pairs of lenses from PinkyParadise. The first set is Vassen Cloud Nine lenses in violet. I had previously tried the grey version of these lenses and I was impressed at how dramatic they were, so I decided to give a few more colours a go. As with most circle lenses, you can feel them at first, but after 20-30 minutes you forget you're wearing them. The look is based off of a look that @JistyPlaven posted on Instagram a few days ago (A.K.A. Petrilude/Misty Maven). I almost never like so much colour, but his look was stunning...so I had to try and recreate it. I used all Sugarpill eyeshadows except for two shadows. I decided to create a tutorial based on a look I posted to Instagram last month. It was based on a look I saw from another MUA user NoJustHenry. 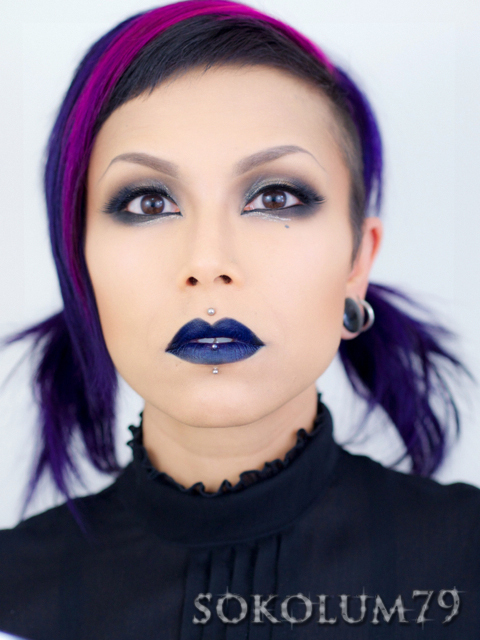 I changed it up, used my favourite MAC Fluidline, Catch My Eye to make a glossy-like look and a dark blue lip, Illamasqua Disciple (which was chosen by my fellow Instagrammers).